Welcome to the parking and transportation department at University of Western States! The office of parking and transportation is dedicated to managing our shared resource and providing alternatives to access the University of Western States campus. UWS encourages those that can do so to walk, bike or use public transportation to travel to and from our campus. Under a Conditional Use Master Plan Agreement with the City of Portland, University of Western States is required to monitor and enforce parking rules and regulations including the charging of a separate parking permit fee and monitoring of the surrounding residential area. Hours for monitoring parking permits in parking areas are from 7 a.m. to 5:30 p.m., Monday through Friday. Unmarked parking areas are also open during the breaks between each quarter, the first week of each quarter and final exam weeks. Parking will be enforced at all hours for unsafe driving or parking in an unauthorized space such as those designated for patient or staff parking. Tickets may be issued at any time for these violations. Need directions to campus? 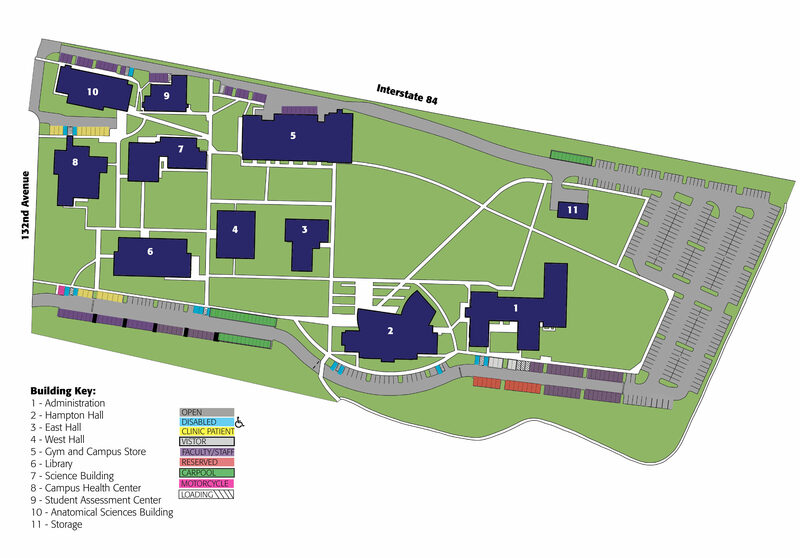 Find the campus map and multi-modal transportation information here. Visitors: Parking spaces for short-term, infrequent use are reserved for visitors who are not required to have a UWS issued permit. Visitor spaces are marked accordingly and are located in front of the Administration Building. Students: Park in unmarked spaces only. A current UWS permit is required to be displayed in the vehicle. Students may not park in spaces marked Faculty/Staff, Reserved, Visitor, Loading or use Patient Parking at any time. Violation may result in a ticket. Employees: Park in spaces designated for Faculty/Staff or unmarked spaces. A current UWS Employee parking permit is required to be displayed in the vehicle. Reserved spaces require a special permit. Employees may not park in Visitor, Loading or use Clinic Parking at any time. Violation may result in a ticket. Carpools: Two or more registered commuters may receive a special carpool permit. To park in a designated carpool space, there must be two or more registered commuters traveling together at the same time and the vehicle must have a current UWS Carpool permit displayed in the vehicle. Carpool parking is enforced all hours. Violations may result in a ticket. Motorcycle: Free motorcycle parking is located in the sectioned off spaces at the end of the SE staff/faculty lot. Parking a motorcycle in any regular parking area requires a regular parking permit as outlined above. Bike: The bike route along I-84 connects our campus. Covered bicycle racks are located in front of the gym building. Uncovered bicycle racks are also available and may be found in numerous locations around campus. Campus Health Center Parking: Clinic parking spaces are only for those individuals receiving care in the Campus Health Center who are not otherwise required to have a UWS parking permit. Given the limited number of clinic parking spaces, on-campus UWS students and employees should park in their designated areas to allow room for those patients that do not have another place on campus to park. Violations may result in a ticket. Parking is NOT allowed on the neighborhood streets. Non-compliance may result in a ticket. TriMet is the local public transportation that runs both the TriMet bus system and the MAX trains. See www.trimet.org to plan your route, get directions, learn how to validate your ticket and ride, find bus and MAX schedules and sign up for service alerts. TriMet offers a Transit Tracker, where the next arrival at a given stop can be identified, if the Stop ID is known. Trimet also offers a mobile app which includes route information and the ability to pay fares using a mobile device. Monthly Passes: Employees may be eligible for complimentary TriMet monthly passes. To qualify, an employee must commute via public transportation at least four days per week, declare busing on the Commute Declaration form and use no more than three daily parking passes per month. For more information, click here to view the TriMet Monthly Pass Agreement Form. Term Passes: Students are eligible for complimentary TriMet quarterly term pass stickers to affix to a valid UWS ID. To qualify, students must commute via public transportation at least four days per week, declare busing on the Commute Declaration form, have a valid UWS ID and use no more than nine daily parking passes per term. Term passes must be picked up at the UWS Campus Store within the first week of each quarter unless arrangement are made with the office of parking and transportation. For more information, click here to view the TriMet Term Pass Agreement Form. Bus Tickets: Occasional bus tickets may be provided to students and employees for UWS-related commuting only. Students and employees may purchase discounted one-way bus tickets at the UWS Campus Store. Registration and Payment: All students and employees must register how they plan to commute to and from the campus. This includes those who individually drive, walk, bike, bus, ride a motorcycle, carpool or are dropped off. Employees complete a commute declaration during the new hire on-boarding process. Information will be kept and assumed valid until a change in commute status is communicated to the parking department. Parking fees are deducted from payroll monthly. Students complete a Student Commute Declaration each term they are registered for courses on campus. The quarterly term permit fee is automatically charged to all on-campus students. Refunds of the parking permit fee may be issued to those students completing the commute declaration by the end of the first week of the term in which an alternative method of transportation to campus is declared. Commute declarations submitted after the first week of the term may forfeit their permit refund. Change in Commute Status: Employees and students must inform the office of parking and transportation of any changes in your commute status. Permit Placement: The parking permit or daily pass must hang from the rear view mirror with the permit number facing out of the vehicle’s front windshield. The vehicle may be ticketed if the permit is not visible. Replacement Permits: Replacements for lost/damaged permits maybe purchased in the UWS Campus Store. Temporary/Daily Parking Passes: Daily parking passes are available for purchase in the Library or Campus Store, limited to nine per person per request. NOTE: The date of use must be written legibly on the daily pass with a black marker to avoid receiving a ticket. Accessible Parking: UWS has spaces reserved for accessible parking for those vehicles with a valid placard issued by a state Department of Motor Vehicles agency. For temporary disabilities, a temporary designated parking pass may be requested from the office of student services. Parking is NOT allowed on the neighborhood streets. Non-compliance may result in a ticket. This restriction is based on Official College Policy generated by the City of Portland’s zoning requirements for UWS Conditional Use Permit. Please help our university to be a good neighbor to the surrounding residents by respecting the rights of those living near our campus. Bike riding on campus sidewalks is prohibited. Bikes must be walked on campus sidewalks to ensure safety. Even if you do not see anyone near you, please walk your bike. This includes all wheeled modes of transportation such as skateboards, scooters and hover boards. Pets are not allowed on campus with the exception of service animals in accordance with state and federal law. Fines and other sanctions may be levied against those who bring animals on campus (this includes leaving pets in cars parked on campus). Vehicles may not be left on campus overnight. The campus parking lot gates will be closed from 10 p.m. until 6 a.m. All vehicles must be removed from the campus parking during these hours. University of Western States is not responsible for damages caused to vehicles that are parked or being operated on campus, nor is it responsible for the theft of vehicles or of their contents. We recommend that personal property of value is not left in your parked vehicle. Parking tickets may be issued for any violations of our parking and transportation rules and regulations. Below are the most common violations. The fees associated with these violations can be found on the Parking and Transportation section of the university website. Any outstanding student parking tickets at the end of each term will be charged to either the student’s account. Any outstanding employee parking tickets will be referred to the office of human resources. University of Western States reserves the right to ticket, tow, or boot vehicles parked on university property in violation of parking policy. All citations and expenses related to violations including towing or booting of vehicles will be the responsibility of the vehicle owner.